PAM: Welcome to another Q&A episode! I am Pam Laricchia from livingjoyfully.ca, and I am happy to be joined again by Anne Ohman and Anna Brown. Hi guys! 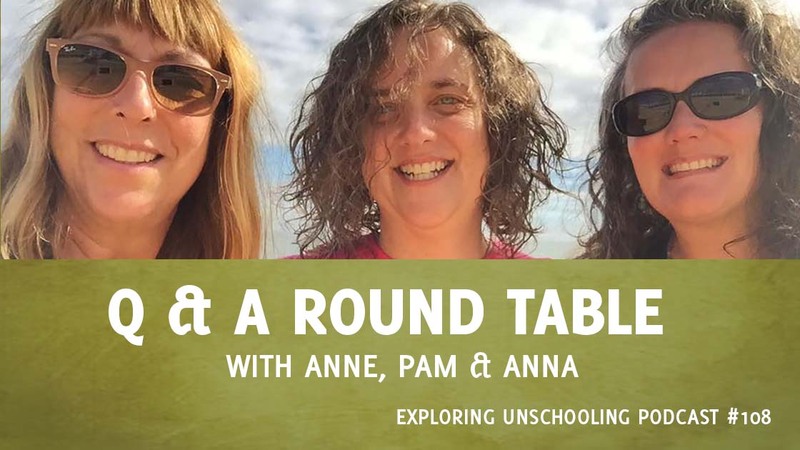 PAM: The three of us host the Childhood Redefined Unschooling Summit together. I have shared my thoughts about it in my podcast introductions the last couple of weeks but since the summit is currently open for registration, and you guys are here. I thought I would ask if either of you would like to share any words. ANNE: I would love to. This is so exciting to be opening it up again because the last expedition that we had was our first online Summit and the feedback and the testimonials that we have been getting have just been heartwarming and completely validating every dream and vision that we ever had for the work that we put into this. What I love about it is like when I am going over the questions for the Q&A here I am always thinking, ‘Oh God, we talk about this at the summit and we dig so much deeper.’ So, I hope that whoever finds value in the three of us and our different voices that we share here in the Q&A, I hope you join us at the Summit because we all do dig deeper with our own unique voices and so you get all theses perspectives on everything. ANNA: Really, the theme, I am just so excited that it is open again. I feel like the fall expedition went, like you said, just kind of the dream. The people that we have met and the feedback that they have shared and the experience of all of it has been amazing. I am super excited and hope more people will join us this time. ANNE: We get to know you deeper—that is the other thing I want to say. You know what I mean? Here we read your questions and everything, but we get to interact with you during the Summit. PAM: I just enjoyed so much addressing the questions, and the conversations that we are having in the Facebook group. It is just so fun to see how people are taking-in the stuff that we are sharing through the Summit and to see the kind of questions and connections that it makes for them and then having those conversations. ANNA: Just seeing the beautiful families. That has been really beautiful and people are sharing pictures and just a lot of little kids that I am not around now it is just, oh my goodness, so beautiful. PAM: Before we get started I just wanted to quickly address an anonymous question that we received. It really was not about unschooling and they had no plans to move to unschooling, so, it was not a question we would typically dive into. But, they were asking whether they could carry an unschooling attitude while their 7yo son went to school, and I just wanted to say that definitely, what you have learned through your unschooling research about how learning works and ways to be in relationship with our children, those things are still true, even when a child goes to school. You can continue to fully support and respect your child, you do not need to bring the school system’s power dynamic home with you. You do not need to value grades just because teachers are assigning them. You do not need to compare your child to other children just because they are in a classroom together. Take a listen to episode 32 with Alex Polikowsky. We chat at length about how she continued to follow her unschooling principles while one of her children chose to go to school. I will put a link in the show notes. Now would you like to get us started with our fist question Anne? We are an unschooling family of four. The two boys, aged seven and four, have never been to school. However, I was previously a primary school teacher so my need to deschool has been great and is still on going (probably unending!). We are a neuro-diverse family, with highly sensitive, spirited children who find some forms of communication difficult. Similarly, my younger son has a need to control what is being done at home, he cannot tolerate his brother watching documentaries on the television or reading books with me. He is unable to verbalize his reasons for this, although I think it could partly be about wanting my attention and does not seem to understand explanations of why his brother finds these things important. We manage it as best we can with lots of options for him (we have a garden with lots of equipment, an indoor swing and trampoline, a range of tablets and Lego which he loves), but often it doesn’t seem to matter what he is doing he still needs to manage what his older brother is doing as well. I try hard to split my time between them or find things that will work for both of them, but this seems to be getting harder to juggle with the need to also feed them and do a little housework (I already outsource as much as I can by hiring a cleaner). I also need to balance my own mental health as I struggle with anxiety. We do not have family near enough to rely on regularly, although my parents do as much as they can to support us, and friends are currently unable to take one or the other of the boys as they find their needs to challenging to fit in with their own children. ANNE: Hi Alaina, thank you so much for your questions and for sharing your family with us. I always love hearing about different unschooling families. I hear that you are doing so much to keep everyone happy and it does feel challenging at times. I see that you are providing your children with things that they need and love in their lives and that feels really good to me. What I want to start out talking about is the thought that family life is something that needs to be balanced. The thing about that is this, the factors that are needed in order to balance anything have to be precise, and unchanging. Or, if they do change or shift, then compensation has to be made on the other side to make it better balance again. That sounds and feels so precarious to me. It is for this reason why I have never used the concept of finding balance in our lives. I remember the first time I examined why that concept did not feel right to me and it was because it felt like saying that we were trying to balance life was only placing even more weight and impossible tasks on our shoulders and burden. So, I have always kind of rejected the concept of having to balance life; even when most everyone else uses that. I instead deeply connect to the concept of allowing the flow of life. And, right there, even as I say that, I can feel such a huge shift from balance, which feels you know forced and precarious, to flow, which feels honoring of life and allowing it. This always happens when I hold on to concepts to ponder them; something so appropriate shows up in front of me which helps me to explain what I mean even better because I use such Anne O concepts in my language. Last night I was browsing Facebook and my favorite page, Trinity Esoterics had a photo about flow. Imagine that. It said, “Navigate your day by what the flow is supporting.” I just want to read the text that they had written out next to the photo. It said, “Dear ones, you put yourself through an incredible amount of angst trying to force things to happen before they are energetically ready to do so. The energies no longer support effecting and forcing, they support flowing and allowing. Navigate your days by what the flow is supporting and you will get there we promise. And the beauty of taking that approach is you will be far less battered and worn when you do arrive at your desired destination. Which means you will be better to embrace it and enjoy it fully. Does that not feel more in line with how your soul wishes to experience things?” So yes, relax into the truth of those words; they are very similar to the words I use when I speak of flow in our lives. Back when my kids were the age that your boys are now, that is kind of what our days were like. I often described our days as ebb and flow. Because it was mostly honoring and allowing ALL that was a part of the flow of our lives. Our activities, our conversations, our home jobs, our play, our joy, our challenges, the times we would be together, and the times we would separate and go our own ways to our own things. Understanding that life is not meant to be forced or balanced is a huge aspect of letting go of control. Even in making a pivot from the way you view challenges that are in front of you. By seeing any conflict as part of the flow, you can tap into that swirling goodness that is all around you as a part of the flow of your lives. Understand that the challenges are a part of that but they are not all of it. They most certainly not something that is meant to be gathered up and balanced. This simple pivot in our language, and our perspective, sets the tone and energy for our days. We can allow the flow to be and float downstream right along with it. Does that not feel like such a relief? The flow of our lives allows us to honor everyone in our family and truly see their needs and desires as a part of who they are. Instead of feeling like they are throwing things off balance. The flow of life includes the joys and challenges yet also holds really infinite possibilities for both in it. Here is an example of what our days looked like when my boys were young. A day that we were at home that is. Jacob and Sam are so very different. Jacob’s energy was very kind and generous and aware and deep and had a weighty gravitas too it. He would sit and read a hundred books with me if he could, and he loved to have conversations. Sam’s energy felt light and playful and he would be playing with sticks or swords or whatever while Jacob and I were reading, yet he would not be too far away from us because he enjoyed listening to the books also. Jacob often loved to direct Sam’s play. Most of the time Sam enjoyed this game with Jacob, following his direction in make believe play because they kind of understood the differences in not only their personalities but in their skills and their strengths and they often complemented each other in this way. Jacob had challenges with his motor skills so that is why he enjoyed having Sam act out their make-believe play with their Playmobil or other character toys. Sam was also Jacob’s hands while playing video games and Jacob would stand by and give him directions in that. That was really cool to watch. During the times when Jacob would be happy doing something by himself or if he fell asleep for a nap, I would seek Sam out and ask him if we wanted to play a game with me or something so that we could have some time together without Jacob’s direction. When Sam was happily playing his video or computer games I would seek out Jacob and we would have our time together reading, having our conversations and doing the things that had value to Jacob. If the other one ended up joining us, we would come together again, the three of us and figure out what we wanted to do, or the two of them would start doing something and I would go off and do something I needed to do. This was our flow, basically. The focus was not on separate needs, the focus was on trust and the coming together and the separating apart—the ebb and the flow. The energy was one of feeling united and connected, no matter what. If an issue came up, we would come together to discuss it and talk about possibilities to solve it so everyone could get what they wanted and needed. And there was a trust in that also. There were no lines drawn, no scales to balance, no measuring one child’s interests against the other. There really was just swirling, flowing life. Probably the most important factor in making sure that the energy of our flow was one of connection and unity was me. I saw it as my job to be the one connecting all of the pieces of who we are and what we needed and wanted. I gathered them up as they were swirling around and then we followed the flow and talked about it if something was not feeling right. Again, it was not my job to gather it all up and try to balance them thinking that I just spent 30 minutes with Jacob, so I need to give Sam 30 minutes. I feel like it was my job to celebrate that flow and stay in an energy that was respectful, joyful and anticipating of fun and peace. That was done through conversations. I have often talked about how our favorite time to talk was when I was doing the laundry or we were empting the dishwasher, kind of when our hands were busy and our discussions were free and happy and full of excitement and possibilities. It was during these times too when I would ask questions about what they were doing and they would tell me about the game, they would tell me about shows they were watching or we would talk about what we wanted to do the rest of the day. But overall, seeing and following the flow of our lives led us to more connection not separation. These positive, possibility-filled conversations and discussions abut any challenging issue that came up and everything brought about and understanding each other’s needs and desires and strengths and depth. So, I am seeing that this might be useful for you in many areas that you describe in your question. An example being, your concern about acquiescing to your son’s needs because even using the word “acquiescing” sort of discounts the validity of his needs and desires. If you see his needs as a part of the flow of your lives, and you see your older son’s needs the same way, then that’s kind of filled with a celebration of who they are. When they see each other being celebrated by you, even in ways that may seem kind of challenging, that brings an awareness and a connection with them where they can more clearly see each other for how they really are: another human being in the family who also has valid needs and desires. You clearly can see that not honoring your son’s need to direct situations is not the best thing for him, nor anyone else in your family. More importantly it brings about a real fear in him. So, seeing his need to direct things as a valid part of the flow of your lives would validate him and celebrate him for being who he is. I just want to tell you this story. When my kids were little and I did parent/child story time at our local library, there was an older unschooled girl there and other parents had told me about how she always needed so much attention and they would kind of groan and roll their eyes when she would come toward us and everything. When I first observed her at a story time, I could see how people could have thought that about her but I knew that she was a sweet girl who honestly did not get much validation in her home for being who she is. So, I understood why she wanted attention. I also saw that she was kind of controlling of things, so I asked her if she would be my assistant at every story time. I would give her specific tasks to do and, oh my goodness, she would just shine so bright. I just came across this a while ago, I have a picture that is so dear to me, mostly because this girl is a friend of mine and is now 23 years old. Her mom passed away a few years ago and, in the picture, she is sitting at the computer with a small child on her lap and a young child by her side and she is showing them how to play a game. She is someone who likes to direct and help. Like my corgi. I just noticed my corgi sitting here—she needs a specific job in order to fully be who she is and then shine. So, I do not know if you find value in that, but I hope you may apply it to your situation. Lastly, I just want to refer to your language again because, like I said, it sets the tone and energy of your home. When you say you dread the shorter, darker, wetter days, you find it harder to get into nature and it is worse on those days, even just having that thought is setting up the energy in your home to project the negativity into the future brings dread and fear and unease into your current moment here and now. It does not allow and honor the flow of your lives because that is in the future sometime. You have no idea what that day may be like, what those days may be like. So, you do not even have to give that a thought right now, you really can just focus on the flow of this glorious day ahead of you and allow it to be honoring all that is in this day and all that you and your children are. So again, there are some shifts I see you could be doing to allow life to bring you together honoring the flow. If you see it as your job to be the one who does the joyful allowing and the joyful connecting, then the children might be able to see each other in a more honoring way also. I really think children can relate to the concept of flow because that is their job as unschoolers, to follow their own flow. So, to talk to them in those terms also, to me, already feels just so connecting. PAM: I just love how you focused on the flow and the flow of life and how it ebbs and flows so much more, rather than trying to look for that balance. I love that you picked that piece out. Hi, Alaina. Thank you so much for your question and definitely, sometimes there are seasons when things feel more challenging. For me, when I could not yet see a way through something I would dig deeper into curiosity mode. So, I would be watching the goings on a little bit more keenly, paying attention for opportunities to engage with my kids in those kinds of conversations Anne was mentioning—you know, side-by-side opportunities where we are doing something we are having a fun chat and it can flow into the conversation. I just had some ideas about those. You could chat pretty regularly with your elder son about his younger brother, brainstorming ideas around ways for him to pursue his interests at home, if he is finding it frustrating. You talked a lot about the way you are seeing these things, but it is important to see how they are seeing it too because that is what you are trying to help them with. You could ask for his ideas and how he thinks you might accomplish them. You want to show him through your words and actions that you guys are a team working on helping him figure out ways to accomplish the things that he wants to do. For example, you could brainstorm some ways he can watch documentaries without his brother interrupting him, like, can the TV be in a room that has a door on it? We were always rearranging things in the house, that was one of the fun things: as our interests and needs changed, things shifted around all the time. Maybe you can read books together at night when his brother is asleep or when dad is home to play with him. Maybe you guys can focus on your elder son going out with dad to museums and activities as often as possible while you can focus on your younger son and fill his needs for attention or play or jumping about with your indoor swing and trampoline and everything. I know you mentioned your husband works quite long hours so I think it would help to plan these outings rather than waiting for the time to open up—if they are in the calendar hopefully your husband may be able to better organize his work around them and your son knows it is coming up so there is tangible proof of doing some things that he enjoys. In these kinds of situations, I found it is also really helpful just to have a plan for the everyday stuff too. Like, “Next time your brother interrupts you watching TV, I’ll invite him to play pillow fights with me in the bedroom.” Then follow through on that. When you come up with that plan ahead of time, now it doesn’t appear to be a random act—they see that we are working with them to meet their needs. Even when we are doing things with their siblings. And then you can chat about it with them later, see how it went and tweak the plan. It will help I think to point out that finding things that work will not happen over night, right? That this is something that you guys are actively working on together. That’s all part of the flow and the conversations and the seeing who is here in this moment and meshing plans that fit with that particular moment. You might apologize to him for his feeling like you care more for his bother. You can explain to him what you see happening with his younger brother with his needs and his fears and ask for his advice on ways you guys might mesh his and his brother’s needs together. Not only do children have great ideas it also helps them feel like they’re part of the conversation, part of that flow. An important part of the way your day unfolds and flows in your family and shows them that their input is valued. You can chat with your younger son too, at his level of understanding, about how we get to control ourselves but not others. You mentioned that he is not able to verbalize it but being able to even just mention it to him will help him consider it, to think about it, and just brings it into part of the flow of your day as well. It also helps you to be picking up more observations—once something is top of mind, we see more connections to it. Your insight about him feeling fear when he is not in control is great to dig into. You can look for patterns in what he reacts to and how he reacts and see what insights you can glean from that. Then I wanted to touch on the idea of acquiescing to his control because that is so interesting. It is another perspective or word that I never used but I can see what you mean. Instead, we always framed things as a choice. So, thinking back in similar circumstances, this only happened when the other child was okay with it. Like I said, a choice. Say they decided that what they saw their sibling wanted was more important to their sibling than what they wanted was to them. I wouldn’t see it as acquiescing; we would see it as I am choosing to join them in what they want to do. Sometimes they could see that their sibling was teetering on the edge and whatever was the issue in the moment was not worth pushing them over. Sometimes they really wanted to do their thing on their own and at those times I would take on their sibling’s reactions; even if it was as you described, an hour-long meltdown, and work with them through it. It was an opportunity for us to be together and learn tools and for them to see my support and to build our trust. There was so much that was happening in that experience as well. So, none of the kids were expected to “acquiesce” to a sibling to make my life easier. They were not responsible for each other—I was responsible for both of them individually. I think that kept a lot of the potential baggage out of their sibling relationships. As they got older, they became so supportive of each other and they still are. But, it was always everybody’s choice; it was not one person emotionally controlling other people’s choices. ANNA: Yes, so much echoing what the two of you have said. I guess what I learned having two small kids close in age is that things change all the time. So, I try to remember that and sometimes offer it as part of the discussion. So, in your situation, you could talk to your older son, saying, “You know, your brother really wants do X and developmentally he is really having a hard time waiting or understanding what we are doing here,” and asking for suggestions from both. State what you see: “You want to do x, he wants to do y, how can we solve this?” And you can start throwing out silly suggestions to lighten the mood and get the brainstorming started. I found that my girls were so much more creative than I was at problem solving and when they were involved in solutions they had this buy in and excitement about it. The process of creative problem solving is such a helpful skill. It takes practice to develop. Oftentimes, I think that parents and moms in particular feel like they have to solve everything alone and that becomes a very huge weight that you are carrying around. As you get better solving things together things get a lot easier. They are both going to be developing and growing along the way so trusting that this part that is rubbing a little bit will pass and change and develop. Work on your language and energy like Anne talked about and enjoying where you are right now—that is going to go such a long way. I did just want to say definitely there is no need to project way out into the future about fears about your son later in life. He is young and he has a lot of growing and changing to do and he is figuring out who he is and how he wants to be in the world and that is just part of the process. I think it comes up a lot where we’re having these conversations again because a lot of times I think we are in our heads thinking, ‘all this we have to do’ and ‘solve it’ and ‘fix it’ and ‘we are having this problem’ and really, once you start that open communication in a family, things just develop so differently and you have that flow and it feels very different than what you are describing, so I think that is just something I want to reiterate. And I also just wanted to say I love your thinking about looking at that bigger picture of changes that you can make together as a family to be together more. You know, we did that along the way and are so, so grateful for the time that we have had together especially now as our children are older and one is leaving the nest and all that kind of stuff so. It is really cool to make that a priority and figuring out ways to make that work when you are seeing that there is a little bit of a rub there with time. Good luck with all of that too. Pam back to you for the next question. PAM: Okay, question number two is from Amy in Oregon. I am becoming acquainted with radical unschooling philosophy. I have often read that you should not do something for your child if they can do it themselves. Also, that kids benefit from doing regular chores/responsibilities. Based on the principles of radical unschooling, what do you think a parent should do if a child does not want to do something they are able to do for them self (as an example, putting their clothes on…I have a 2 and 4 y/o). Same thing for doing chores, what if a child does not want to do a chore or to help with household tasks? PAM: Well thank you very much Amy I am glad you are enjoying the podcast. As for your question, those kinds of, ‘if they can do it, they should do it themselves,’ are wrapped up in generic, conventional expectations and rules. What we can do instead is look to our children as individuals with needs, wants, motivations and realize that each moment is unique and worth considering. So, for example, they are not wanting your help getting dressed to frustrate you, there is a real and valid reason behind it—you just do not know what it is yet. By helping them you are building their trust in you that you will be there to help them whenever they want it. Even when they are young, especially when they are young. I love that, and it is so true. Now is when we are building the foundation of our relationship with our children. Now is when we are building their trust in us. Will we be there for them when they ask for help? It is not really about getting dressed, it is about your relationship. If they learn through experience that you will not help them do things when they ask, because you have judged them capable of doing them on their own, that is the relationship pattern that they will learn. It might help to think of this in terms of your relationship with your partner or spouse, when you ask for help with something how would it feel if they answered you, “You can do that yourself, so I am not going to help you.” Your request for help was not about your ability to do the thing, it was motivated by something else, some other need in your life, and it is the same with your children. Now, I think I am pretty safe in promising that you will not be dressing them when they are sixteen. They do not need to be forced to practice. We do not need to push them to be independent; they really, really will get there all on their own, on their own timetable. In the meantime, we can focus on the relationship, building the connections and trust between us. You know what? It is exactly the same with chores. You feel free to invite them to join you, you can enjoy their company and maybe some of their help and not judge the results, but it is okay if they say no because, in that moment, maybe it is not in their flow. ANNA: Yes. I’m like, ‘Wait, I am saying that too!’ I just never really identified with those beliefs because, like you said, it is really a whole different paradigm. I do things for people all the time that they can do for themselves—my husband, my mother, my friends—and of course I am not doing everything for them but I would never not help them because they could technically do it. That is part of our relationship and the connections—being human beings together. With dressing little ones, gosh I would just say, savor every minute of that because before you know it they will not need or want your help. I found, just like Pam said, when kids ask you to help with something that they can do, they are often looking for connection. It is not about whatever the thing is that they are asking about. That is something that I wanted to provide at every opportunity. Our culture has an independence agenda and it starts at birth. I chose deliberately to instead foster connection and community. As for chores, it is the same: we never have chores, we live in a house together, we did the things that needed to be done. We have talked about this on the podcast before and I think Pam has had specific podcasts about it. I think it helps to look at expectations, needs, wants and to keep the conversation open again, just like I said with the last question—this is all just about conversations. We don’t have have-to’s or expectations, we can just talk to each other and ask for help when it is needed and it flows. I think that trust really develops when you do that, because when I am asking for help, like Pam said, it’s not because I can’t do it myself, it’s because I’m tired or something else is going on or I need help here to get this other thing done. So, when we have those conversations and we are open about our needs and what is happening, that trust develops, and people help. We just really have never had an issue when it comes to this. That doesn’t mean that there have not been things that I haven’t had to change my expectations about, but that’s not just related to kids, that can be related to my husband or someone else. So, then I have to look inside of me and what are my needs related to this. Again, there are some other podcasts where we talked a little bit more in depth about that but those were just a few things I wanted to share. ANNE: Yes, and I knew Anna and Pam would cover all of that. Oh my goodness, that just added to all of the feelings of love and coziness that I was giving to myself as a gift after having some challenges in that day. That is it, right there. Not only that for our children but it is one of the greatest gifts of my life, to help my children when they ask for help. To recognize that and I have recognized that more and more as they get older and need different kinds of help. I never ever once told them in all of their lives that they can do it themselves. I let them know, yes, it is an honor for me to help you. Again, that does not matter—that is not why we did it when they were young, so that they would help us when we were old and needed help—it just is who they are and who they have become. Sam even told me recently, he gets such joy from being available to help us. And wow what a gift that is. We are still helping them all that we can; our kids have told us that we are the most generous parents in the world, and that comes from a place of deep love and respect. The feeling that they are still being cared for as adults that they are not alone and have to go out into the world by themselves. That is a scary thing for kids to think about and yet when they are brought up with this foundation of my parents are here to help me no matter what I ask, that is the most wonderful feeling in the world. To me it is a deeply spiritual one because when I connect to my inner being, my source, I connect to that very feeling: that I am incredibly loved and that I am always taken care of. For me to deliberately choose, to be in the mindset that helping my children was a gift to me, was just incredible. It allowed me to receive the gift, to be open to receiving the gift of helping my children. Today it carries through, as Anna was saying. I help so many people and my families at my library. My mother that has dementia, I help her with anything and everything and I am honored when I am at my mother’s feet putting her sneakers on and tying her shoes, seriously. I have always felt that the giver is as blessed as the receiver. Not even with all these other reasons but that is the only reason that I need for why I see helping my children or anybody else as a gift to myself. It is simply the way I choose to look at and live in this world. PAM: I love that. And you know, when you were talking that reminded me, there were a few times when my kids were in their teens and other children were here visiting. I was very happily choosing maybe pull together a snack so that they could get really comfy and watch their movie or whatever—just do whatever. Even lately making a lunch for Michael before he goes to work. But I do not feel it as a responsibility; I feel it as a gift, as something I want to do for him because I have the opportunity, because I am here. I know he appreciates it. It has never flipped into an expectation—he never expects me to do it. The few times when something has come up and I have not been able to, he has whipped together his lunch and off he goes. It is never, “Mom, you haven’t made my lunch yet,” or something. But I remember the comments from the kids were like, “No, no, we can do that,” and they would be shocked when I would say, “Oh no, I am happy to do it.” I’m choosing to do it. They would look at me like I had two heads because it was just something that was a very different for them. They had been told, if they could do it, they should do it for themselves. ANNA: For me it is just all about relationship. Like this morning our recording got pushed back just a little bit and I was so glad because my daughter who is 18 years old was heading off to work. She can get her own food and go and she drives herself to work and she does completely without me but I actually just really love that time where we talk in the morning and I will prep her food and do and we are chit chatting. You know, it is not a have-to or a need-to or she is expecting it but it is a gift and it is a special time to me. So you know, I think it is again what I want to foster in our family. ANNE: Right. And I am taking it a little deeper also: it is in the asking. This is a conversation—we always talk about conversations. This is the start of a conversation, the child asking for help. It is not that we have to say ‘yes’ all time if we are doing something, but the build-up of honesty and trust through these conversations allows us to be honest and say, “Oh, yes, I would love to help you. Can I finish this first or do you need me right away?” And stuff like that. You know what I mean? It expands it. It’s not just, ‘Yes, I am going to drop everything.’ It is the honesty and trust. Like yesterday, we had an ice storm Saturday and I was up late texting with Sam Saturday night. He was talking to me about some things in his life and I asked him if he wanted to come and be with his dad and I on Sunday. Because he was talking about how he would love to connect with us. So, I wrote to him Sunday morning and I said, “Dad needs to do ice removal and bring in wood if you want to come and help and make some grocery money and stuff.” He said, “Does he need help? Because I do have stuff in the oven and I am kind of low on gas and I need to save it for just going to get groceries today and all this other stuff.” You know what I mean and so that is the conversation also. We are not just talking about saying yes to everything—the conversation is truthful and honest and so respectful and with a foundation of love and kindness. That is what we are talking about. PAM: And it is back to the flow right? ANNE: Exactly, yes, yes. That is it. The flow of Sam’s life for the day was not in the direction of doing this and it is honoring all of that. The flow of life it is beautiful. ANNA: I am going to go to question three from Del. ANNA: Okay, thanks for that question! As I am rereading it, I noticed a couple of things that I did not notice the first time, so I may come back to that in just a second. But, you know, I think you’re right, it will get easier as they get older. In the meantime, there are some ways to be a bit more concrete about them. When you get home from the store, dividing those types of foods into, ‘available for snacking,’ and ‘used for cooking.’ And the snacking items can be in a special drawer or a spot in the fridge and they will see in one spot what they have for that shopping period. Sometimes they may want to buzz through it all in one day, other times they may decide to make it last. I think is just probably too much to ask for them to conceptualize what would be needed for cooking over a long period of time as well. So, taking that out of the equation might help. Look at the budget and what types of things everyone is enjoying, involving them in the planning out of meals and snacks so that they feel included and have buy in. They may even like to see it written down and have a list about it. We never did that, but just throwing out some ideas. We have never had budget constraints exactly like you are describing but we definitely had things, especially snacks and treats, that ran out before the next shopping trip was coming up. We just kept an open dialog and learned together how to make things last. Then we got creative when things were gone and we still wanted a certain type of snack. I definitely found it was cheaper to make snacks than to buy organic or natural snacks, so that helped us stretch our food budget. Even though it would at a little more work for me, it was well worth it. The girls would, at different times, enjoy participating in the cooking process, sometimes making things with me, sometimes just keeping me company. So, that became another you know relationship and connecting opportunity. I think with anything it is all about communication and not getting stuck in the thinking that there is one right way or one desired outcome. Be open and see what kind of ideas you all come up with for getting what you need within the framework of your budget, including looking at other areas of the budget. We found sometimes we liked to let go of other expenditures to fund something that we were more interested in in the moment and then we would switch that up. So again, I think it is about being open and talking. What I picked up on when I read the question this time, was that you are not there, you are not doing it and so I think that is really important because when we are constructing scenarios in our head about how it is going to play out, that is not what is really happening. What I found is that kids are very capable of having conversations and figuring things out and working together. In your mind, you may be thinking, ‘Oh, they can’t handle this, they are not going to do it,’ but I think in practice you will see that they can. I think especially as they learn to trust and open up around food, what I saw over and over again was the children that were controlled around food were the ones that had inability to have any kind of self-control around food. They would come to my house where I would have different things available and they would just be shoveling in at the bowl and not playing or doing anything because they had never been able to have this sweet or this thing or whatever it is. Whereas my girls, who had options to have other things, if they wanted a sweet they would eat a sweet. If they wanted something salty they would get something salty. We talked much more about what your body is looking for because whenever we have someone externally controlling us we tend to be drawn to wanting to do that thing and make that our own. I would just say dive in, trust, have the conversations. I think it is going to be a lot easier than you think it is going to be. ANNE: I started picking up our candy and putting it away when we have had those visitors because they would eat all of our candy and you could tell, I had to become what other parents do because I did not want all of our stuff gone so—it’s funny. I would like to focus as usual and again on the language and energy that you maybe attaching to this, so you can be aware. I grew up in a home where the focus was on lack and that did not feel good or safe to me at all. My parents never seemed to have the money for the things that were valuable to us kids and yet seemed to have money for things that had value to them, like a bottle of wine. So, I just want to, as Anna was saying, make sure that that is not what you are seeing and without even thinking about it, maybe you are saying these need to be for cooking or whatever. Maybe validate the fact that they see stuff that they want that you want to cook with. There is just a lot of reassessment that could be going on here about that. Because, like Anna was saying, if life is just a constant ‘no’ for them around food—much like the child that has his sugary foods restricted and gorges on candy—the child that lives with the lack mentality may think that when they do get some money on their own, they need to create an overabundance of these things in their lives that they were told ‘no’ to all the time. For me, it is just important to have a yes energy. Not in, “Yes, you can have whatever you want when you want it,” but “Yes, I see that sounds good to you to have right now, let’s see if we can get more the next time we go. Remember that it is something that you love. “Let’s look at the grocery list again and see how we can work things out.” You know what I mean? So that is just what I would like to focus on because again, we are the creators of energy in our home and that is why our language and energy is important. PAM: Yes, definitely the same kinds of ideas: inviting them in to help with menu planning, mentioning the meals and the snacks and the things that contain their favorite ingredients. Just chatting about the stuff that they love. Involving them in the process gives that abundance and ‘yes’ focus. You can invite them as Anna mentioned into conversations even around the family budget and Anne had the wine story too. It’s just getting a feel for what it is that everybody wants to have, and the things that they are interested are just as important as the things that we are interested in. You can play around with those ideas. It’s not that you’re being directed by them; it’s that we are all having conversations together and enjoying that. It’s just shaking things up and involving them as much as they are interested in being involved in those conversations. I loved Anna’s idea about when there is things that everybody wants and there is a certain amount, being able to say, “Hey, look here is your share, and your share. This is what we’ve got until the next time we go shopping.” And if it runs out fast, you can have more conversations about, “Oh, if we increase that, what can we buy less of? What do you not want as much?” It just sparks so many conversations. So, even if there is a reality of no, you do not have any more of that particular thing now, that is just fodder for more conversations. It does not have to be a heavy weighty, “No, I am so sorry.” It can be, “Oh, that’s gone. What was it that you liked about that? Was it the texture? Was it sweet? Salty?” All that kind of stuff and see what you can substitute until the next time. Again, coming back to the flow. It’s all that just happens it the flow, it is part of the constraint of this moment, where can we go from here, and making it a part of the larger conversation just within the family. ANNE: Question number four from Cher in New York. Hi, Cher! I’m in New York. ANNE: Okay I hear you and I know that does feel really difficult when that comes up. When my kids faced circumstances like these—again, I am going to talk about language—I never thought them to be innocent and naive. Because, oh my goodness, that’s just a huge disservice to them, as they are such well-informed unschoolers who probably know more about the real world that most school kids do. So, I want for you to remove that. And the fact that they have been brought up in a respectful and trust-centered home, is the reason why they simply have no reason to not trust someone, to not think that someone has the best intentions in asking them questions. So, now their worlds expand again, and they see that some people, not just kids, for whatever reason choose to act like bullies. One thing to be aware of also is the fact that your kids do not have the same experience bank as you do, and they are not seeing it through the same lens as you are. As you said, you take it personally, and maybe that is part of your deschooling. And that’s great that you see that because that is a slippery slope to be on when your children have challenges—or for anything in your lives. A great asset to any situation in our lives is to remember to not take what is happening in our children’s lives personally. So anyway, it might be good to ask them what they think about it, how they feel about it, if you have not already. Because when I see bullying happening whether it is in real life or in television or movies, what frustrates me the most is that often the energy of the person being bullied changes and they become exactly what the bully has projected them to be, the victim. Then again that is not always the case. I also witnessed children standing up for themselves not allowing anyone, not even their parents to coerce outside of what feels true and right to their own spirit. There are many people who do not allow any one else to make them feel less than the magnificent being that they are. I love it when I see that. I think their best defense is to truly own this incredible secret of unschooling that most kids do not have access to, not even a little bit. Perhaps remind them about and instill some of that magical joy in their lives as they go off without you to do something that they are passionate about, which is what unschoolers do—their gymnastics. It might give them strength as they leave you, strength and confidence in that you know the magnificent beings that they are and strength and confidence in this life that you live together. If they are asking you specifically how to handle it or what to say, I might tell them first of all they have no obligation to answer them if they do not want to or if they do want to answer, they could simply say what is true of their lives. Like, if it was something I was interested in learning or needed to know for a reason, I could look it up or figure it out or ask someone who knows, or, ‘You just told me the answer, so thank you. You are smarter.’ You know, whatever feels good to them. It is not the specifics of the answer, it is the energy I just wish for them to maintain while it is happening. Just holding on the secret of their joy filled lives that unschooling is and not to believe anything the kids say about how smart or not smart they are. PAM: Hi Cher. I will just reemphasize the first thing to do is to ask your boys how they feel about it. Maybe you have, and you didn’t mention it, that is fine but yes, that is the difference. Especially when we are starting to take something personally. As soon as I feel that, it is like, ‘Uh oh, I am feeling something.’ Taking personally some situation that I am not personally involved in. That is always my clue that it is time to go figure out how the people involved are seeing it. So, as far as your boys are concerned, is it an issue for them? Are they happy to just keep replying “I didn’t learn that yet”—that’s fine. Are they wondering why the kids keep asking them things? These are the fodder for conversations. Maybe they are there just for the sport, not looking to develop any relationships with the other kids because, as you mentioned, they have their great unschooling friends. I bet they can already see the difference in the attitudes and the kids, and maybe they are just not looking to engage with these gymnastics kids. If they are happy with the way things are, it’s probably something for you work through. Now, I remember in those moments, when I discover it is mostly my work to do, I often actually look to my kids. Can I embrace their perspective on this situation? They are letting it roll of their backs. Do I have some baggage from my childhood that is getting in my way? If they mention that it does bother them, you can, as Anne mentioned, brainstorm some fun responses that will feel good to them. Maybe, asking a hard question back that they have memorized the answer to. I have heard from some people that that has worked for them. But there is just a million ways you can go with that. I just though I would share a story because this reminded me of one year at girl guides. Lissy was getting tired of the questions and negative comments from the other girls and asked me to help her out. It was obvious from the questions that they were often just repeating what their parents had said to them when the girls had come home to announce that there was a girl there that did not go to school. So, I chatted with one of the leaders. I mentioned that it was not Lissy’s job to defend our lifestyle and I offered to put together a one-page hand out of answers that they could hand out to the other parents. I was putting together my notes last night and I did a quick search of our backups because Rocco is a wiz at that stuff and I actually found the document! I wrote it in December of 2006, so eleven years ago, and Lissy was twelve. I titled it “Some Questions and Answers About Homeschooling.” I didn’t even use the word unschooling. There is no need to go there—they did not even know what homeschooling was. It opened with, I get the impression that there are a number of questions surrounding our family’s choice to homeschool. This is completely understandable because this choice is not a very well-known option so I thought I would share some answers to typical questions. And here are the questions that I included—so, these would have been based on the comments that Lissy was getting, the questions were: Is it legal? Do you follow a curriculum? How do you make friends? How do you get into college? And then there was a short, more information section with a few links, including a link to my website. And I closed it with, I hope this information has been helpful, feel free to as me if you anymore questions. So, I specifically said ask ME because I did not want questions going to Lissy any more and that took care of it. I didn’t get any questions and I imagine there was still the odd comment once in a while, but it was no longer overwhelming for Lissy. I just thought I would share a time when that had happened with us at an activity and the approach that I took in that particular situation. It really is about how they are interpreting the situations. So I would definitely check in about those things but we too of course ran into a little bit of that and we would have discussions over the years about how we wanted to handle it, or how they wanted to deal with it. Sometimes we would turn it around and they would say things like, “Oh, that is cool you like school, I like to sleep in and I like video games.” Sometimes they would go, “Huh, wait a minute.” Or, what Pam said too, we would share questions or about things that we loved. I thought of an example I was just sharing with somebody yesterday. Did you know that vulture poop is an amazing sanitizer because it contains its digestive acid that virtually kills all bacterial viruses? We have all kinds of those things because we explore the world, so we all have things that we know that other people do not know. So, keeping it light and fun. So, when you see the child becoming deflated, that is where I would worry, but my girls were always like, “That’s cool that you like that, I really like this better.” But I think, and Pam may have mentioned this, if these are important friends and this is something where they want to establish relationships and not just go in there for the gymnastics, then, help them find ways to connect and become closer and maybe hang out or get to know them outside of gymnastics. Because I think that personal connection really stops that kind of bulling behavior as we humanize one another. If it moves into that more bulling type territory, I would talk to the people involved and I loved Pam’s idea of just kind of proactively addressing it. I think so often it’s when we don’t know something or are confused by it, there are those of us look at that with curiosity and interest and want to learn more about it, and there are those of us who try shut it down and are scared of change or things that are different. Just understanding that side of human nature and seeing if there is a way to address it, is really a lovely way to diffuse some of that. I would also probably see if I could be closer to observe what is going on, as opposed to, you mentioned that you’re not there and you don’t know what is happening—it’s just what your boys are saying. I guess that little piece also that made me think that what your boys are say is valid and important and so, just watch the energy and language about that too. Anyway, hopefully those are some ideas that you can use. PAM: And that is the last question for this month. Thanks so much to both of you for answering questions with me it is always so fun and I always love seeing what take you guys take. Just a reminder there are links in the show notes for the things that we have mentioned in the episode and Childhood Redefined Unschooling Summit online is open for registration until the end of January.